A David versus Goliath courtroom drama with plenty of appeal, The Rainmaker enjoys a stellar cast in fine form and hits all the right notes, but never quite reaches the emotional heights that it strives for. Rudy Baylor (Matt Damon) graduates from law school in Memphis, and the only job he can land is with the office of ambulance-chaser "Bruiser" Stone (Mickey Rourke) and his crony Deck Shifflet (Danny DeVito), who has never been able to pass the bar exam. Shifflet takes Baylor under his wing and teaches him the ropes. 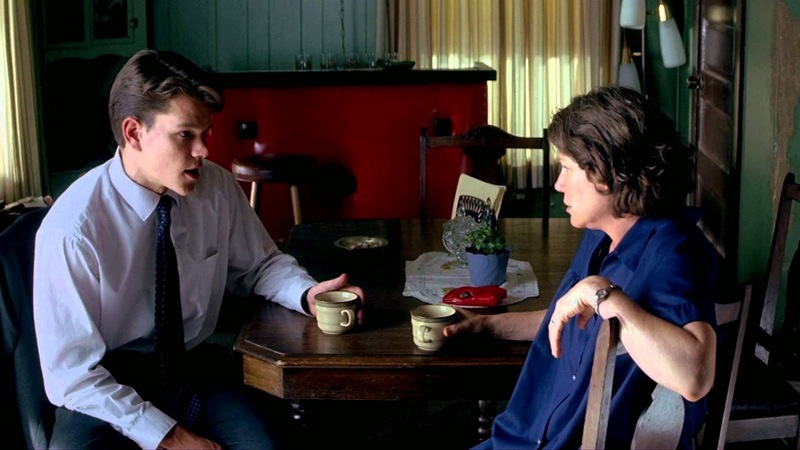 Soon Rudy has three clients: the elderly Miss Birdsong (Teresa Wright) wants to rewrite her will; low-income mother Dot Black (Mary Kay Place) wants to sue the Great Benefit insurance company for denying coverage for her leukemia-afflicted son Donny Ray (Johnny Whitworth); and Kelly Riker (Claire Danes) is being regularly physically abused by her husband. Bruiser runs into some serious trouble with the law, prompting Rudy and Deck to establish their own business, as the insurance company lawsuit starts to occupy most of their time. Great Benefit hires a crack team of lawyers headed by the slick Leo F. Drummond (Jon Voight) to defend the case, and Rudy finds himself out of his depth in terms of experience and resources. But Dot refuses to settle, and the case lands in court, with Judge Tyrone Kipler (Danny Glover, in an uncredited performance) presiding. As Kelly's confrontations with her husband grow ever more dangerous, Rudy has to uncover Great Benefit's unethical practices to convince the jury that Donny Ray never received the medical treatment that he deserved. By the time The Rainmaker arrived in movie theatres as a big-budget, high-quality adaptation of a John Grisham novel, the 1990s alone had already offered a multitude of quality courtroom dramas including three Grisham adaptations. A Few Good Men (1992), The Firm (1993), In The Name Of The Father (1993), The Client (1994), Sleepers (1996), and A Time To Kill (1996) featured big name stars, big name directors and some seminal courtroom moments, and The Rainmaker unfortunately suffers from the nagging feeling that Hollywood was perhaps going to the same well one time too many. There was little new that the genre was able to offer by 1997, and while The Rainmaker does everything right, it doesn't do much that is particularly memorable. Director Francis Ford Coppola wrote the screenplay, and in one of his more traditional outings, steers the film safely through all the tight corners. The 135 minutes of running time pass by smoothly, and the Memphis setting, mostly in the grungier parts of town, enriches the context. 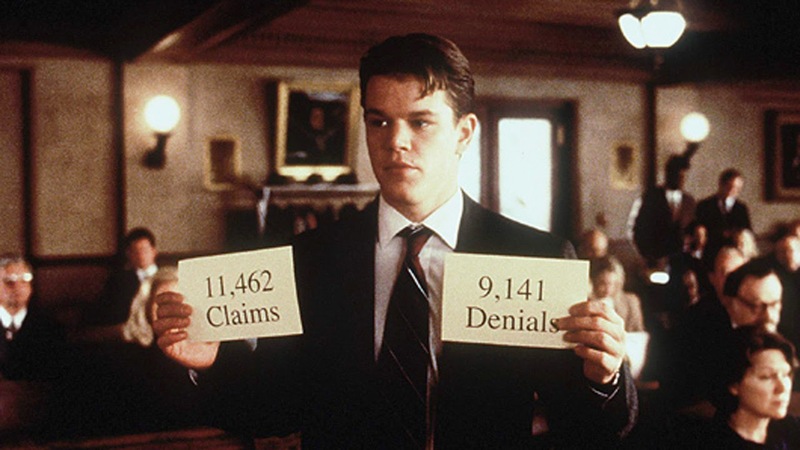 Rudy Baylor is a likable if somewhat bland protagonist, and Matt Damon applies his boyish charm in the right doses to make the rookie lawyer a scrappy hero worth investing in. The narration provided by Baylor, is, for the most part, unnecessary. The three stories compete for attention in the first half of the movie, but the insurance lawsuit dominates the second half, and the movie evolves as expected into a satisfying high-stakes courtroom showdown to influence the jury. Jon Voight does his part and creates in Drummond a worthwhile adversary who justifies his high fees by shredding witnesses just when Rudy starts to believe that he might gain an unlikely upper hand. The other two legal cases, involving Miss Birdsong's will and Kelly's domestic abuse, do get short changed, and ultimately get in the way of the main narrative thrust and are almost all but discarded. Miss Birdsong's ordeal with the will is a great excuse to see Teresa Wright on the screen one last time. Kelly's wife abuse story takes a turn towards mayhem that has all the appearances of a desperate attempt to occupy Rudy with something other than the insurance firm lawsuit. Danny DeVito, Mickey Rourke and Danny Glover add plenty of animation and some moments of humour, while late in the case Virginia Madsen and Roy Scheider make telling contributions in the courtroom. Despite having its heart in the right place and working the big bad corporation theme to perfection, The Rainmaker lacks a killer moment of impact to differentiate it from other legal dramas. This does not make it a lesser film, just a lower profile but still enjoyable adventure in the jungles of the law.